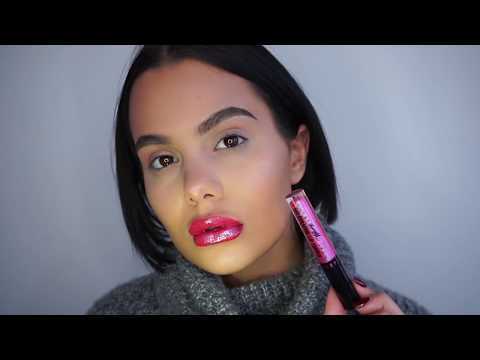 Barry M Holographic Lip Topper Wizard is a lip topper with beautiful shine. This lip topper contains reflective particles, so your lips will look different in every light and from every point of view. The lip topper is long lasting and has a delicious smooth formula that does not stick. Go for a holographic effect on your lips or give a unique finish to your favorite lipstick. Wear on your own or about lipstick. Start before applying at the cupid arch and apply to the outside. Then apply to the lower lip, start at the middle and apply to the outside. Polyisobutylene, Ethylhexyl Palmitate, Tridecyl Trimellitate, Silica Silylate, Hydroxystearic Acid, Polyethylene, Polyglyceryl-3 Diisostearate, Simmondsia Chinensis (Jojoba) Seed Oil, Squalane, Dunaliella Salina Extract, Tocopheryl Acetate, Phenoxyethanol, Flavor, Calcium Sodium Borosilicate, Titanium Oxide, Tin Oxide, [+/- Ci 42090, Ci 15850, Ci 45410].